If you think doughnuts are best left to your baker, think again; this recipe gives brilliant results without lengthy kneading or a mixer. All you need is a little patience. 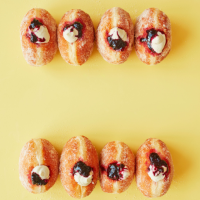 Combining strong and plain flours with butter and eggs gives a doughnut with an almost cake-like structure that won’t go stale too fast – if you can resist them, that is! 5. Divide the dough in 2, roll each piece into a rough sausage and cut into 8 equal pieces (about 50-60g each). Use more flour to shape into smooth balls. Place the balls on the floured baking sheets, well spaced out, then cover loosely with oiled cling film and leave in a warm place to prove until almost doubled in size – about 45 minutes-1 hour. (You want the dough to be well risen but not so much that it is starting to lose shape.) It is now ready to cook.